You can purchase the latest Deep HIARCS and Deep Junior chess software direct from the developers on this website. 2019 SALE - SAVE 20% today! June 2018 HIARCS wins CSVN tournament with 9/9! HIARCS Chess Explorer for Mac OS SAVE 20% today! 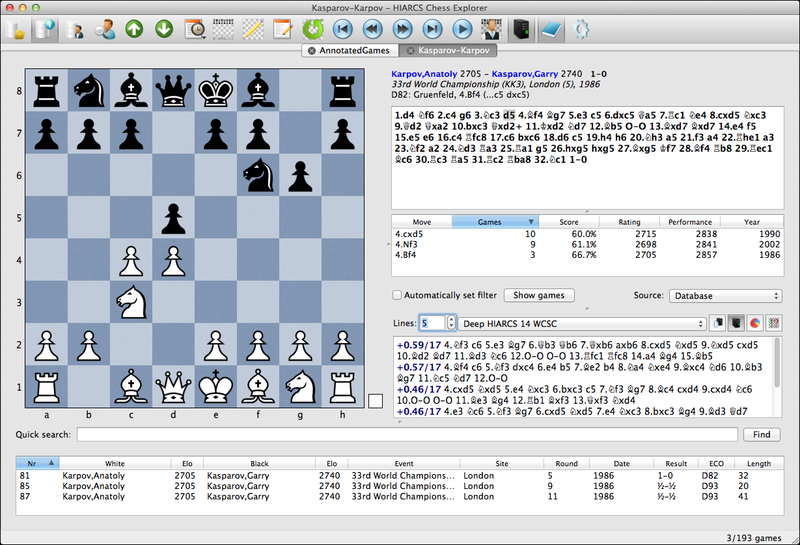 HIARCS Chess Explorer is the best chess database, analysis and playing program for Apple Mac. It offers a truly innovative and intuitive new graphical user interface with powerful features together with the World Chess Software Champion HIARCS 14 chess engines (Deep multiprocessor or single processor versions). This unique combination is refreshingly easy to use and includes many new features for managing chess databases, chess preparation, analysis and training for players of all abilities from beginner to Grandmaster. Read more about HIARCS Mac Chess Explorer..
Advanced Chess Graphical User Interface with high quality chess graphics (retina enabled), easy to use powerful features, comprehensive 108 page manual and context sensitive help. The engine generally used by World Chess Champion Vishy Anand. 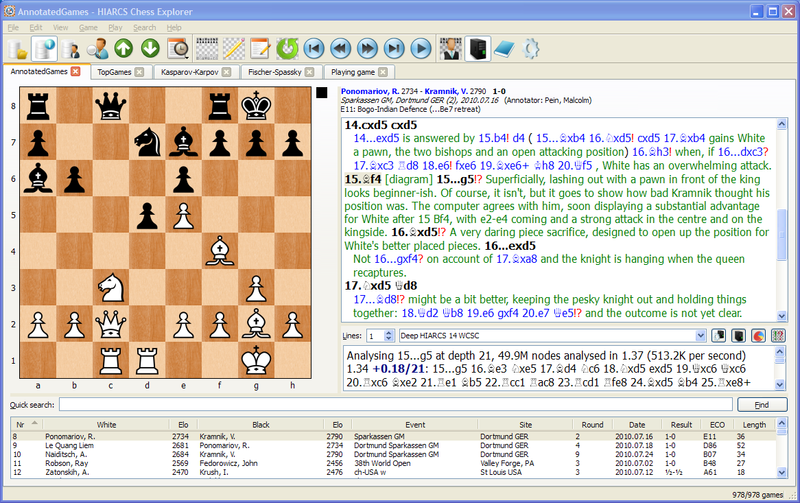 Deep HIARCS 14 engine is included in Deep HIARCS Chess Explorer product. Comprehensive PGN database support with multiple databases, searching, filtering and sorting by game, openings and positions, ECO opening name classification, etc. 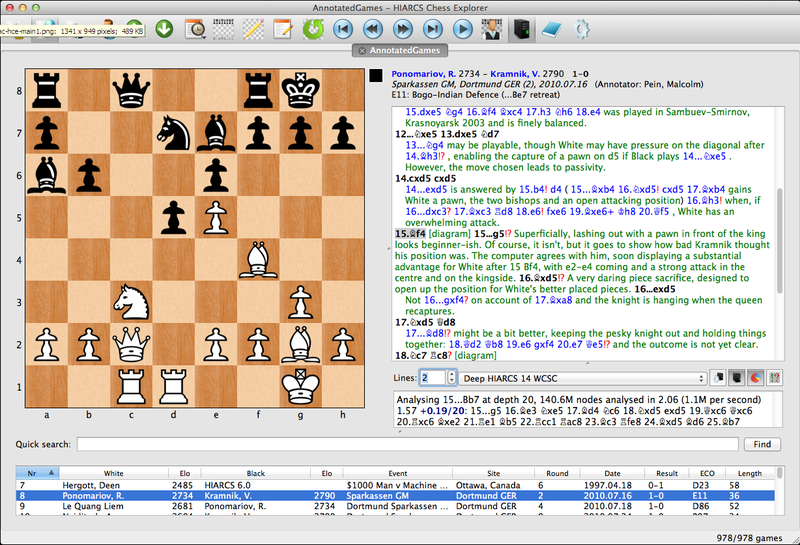 Extensive game notation support with variations, text comments, annotations, chess symbols and opening naming. Game entry, move suggestions, diagrams and printing. Innovative Chess Opening Explorer gives new insight into chess openings with the world’s first multi-source real-time chess tree with online book access. Create an opening book tree of the positions, moves and statistics of your games or your opponents automatically. Explore Players their games, performances and favourite openings with easy game navigation and an automated repertoire summary for databases and players. Analyse positions and games with multiple engines, view multiple lines of analysis with history/statistics. Post game analysis with variations - blunder check your games. Custom Game Play mode with realistic human-like handicap levels for players from beginner to Grandmaster. Maintains a chess rating, opponents to match your ability. Integrated coach to point out mistakes, good moves and hints. Chess opening play practice. Packaged databases of high quality GM games including game commentary by IMs and GMs. Online access to massive chess endgame and opening book databases. HIARCS Mac Chess Explorer is a software download product. It is a complete chess application with world class Graphical User Interface, chess engines and chess games databases, opening books and endgame tablebases. The ultimate chess software for the Apple Macintosh. "In summary, this is an excellent chess system that is suitable for players of all strengths. It has a lot of features, comes with a super-strong engine, and it is very easy to use. Highly recommended" - Joe Petrolito, Independent review for Australasian Chess. "HIARCS Chess Explorer on the Mac is an excellent program and great value for money"
HIARCS Chess Explorer is an exciting new chess database, analysis and playing program for Windows. It offers a truly innovative and intuitive new graphical user interface with powerful features together with the World Chess Software Champion HIARCS 14 chess engines (Deep multiprocessor or single processor versions). This unique combination is refreshingly easy to use and includes many new features for managing chess databases, chess preparation, analysis and training for players of all abilities from beginner to Grandmaster. 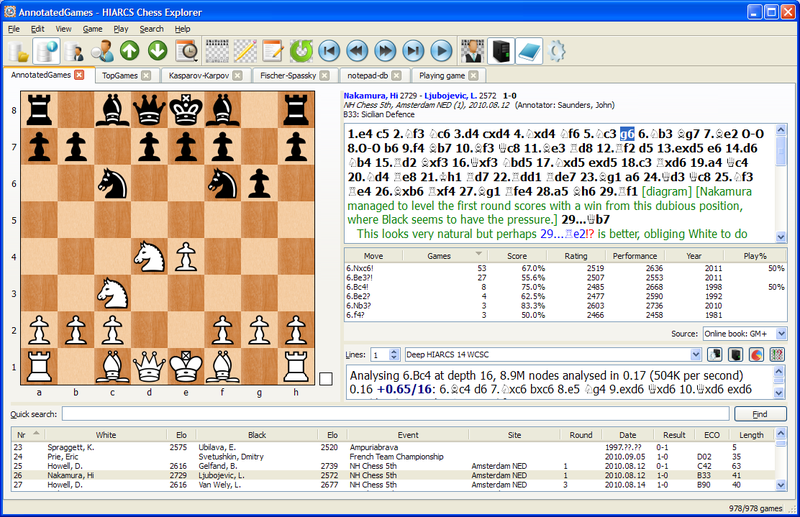 Read more about HIARCS PC Chess Explorer..
Advanced Chess Graphical User Interface with high quality graphics and icons, easy to use powerful features, comprehensive manual and context sensitive help. HIARCS 14 World Chess Software Champion chess engine - incredibly strong analysis, advice and play (free updates in 14 series). Includes the World's strongest commercial tournament openings book accessible directly by the engine. Innovative Chess Opening Explorer gives new insight into chess openings with the world’s first multi-source real-time chess tree with live updates and online access. Create an opening book tree of the positions, moves and statistics of your games or opponents automatically. Custom Game Play mode with human-like handicap levels for players from beginner to Grandmaster. Maintains a chess rating, opponents to match your ability. Integrated coach to point out mistakes, good moves and hints. Chess opening practice mode. 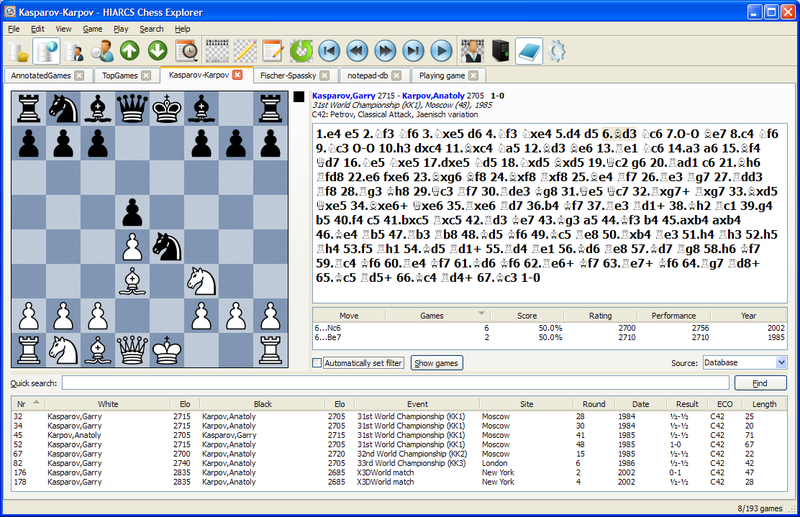 HIARCS PC Chess Explorer is a software download product. It is a complete chess application with world class Graphical User Interface, chess engines, chess games databases, opening books and endgame tablebases. Deep HIARCS Chess Explorer GM+ book update - more than a million moves added! "I subscribe to your Powerbook now and I'm pretty impressed by it, I use it all the time in my chess teaching. As far as I know it is the best publicly available book." Larry Kaufman, Grandmaster and World Senior Chess Champion. 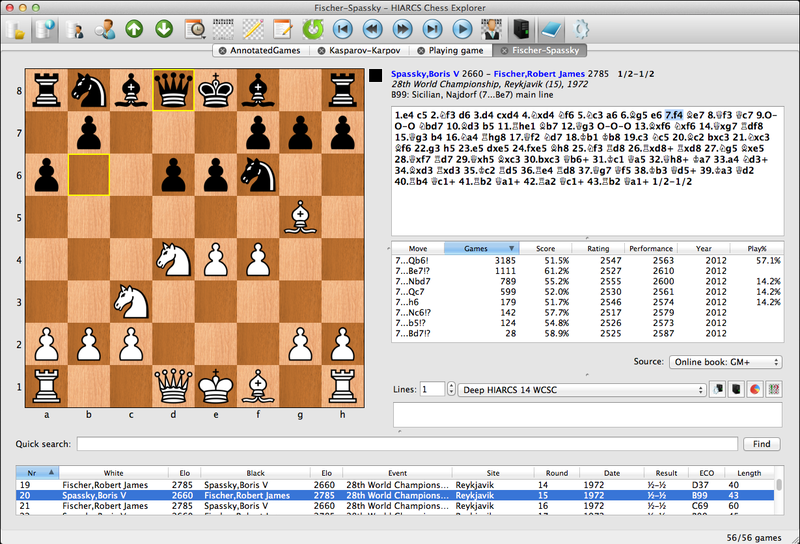 HIARCS Chess Explorer provides online access to GM opening books as standard. 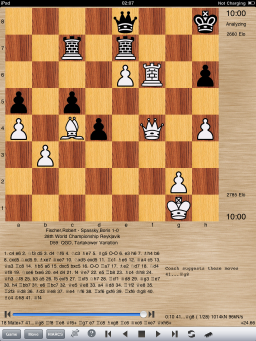 If you want to enhance this to have access to the World Strongest Chess Opening Book and a Human Reference of opening play this is the product for you. 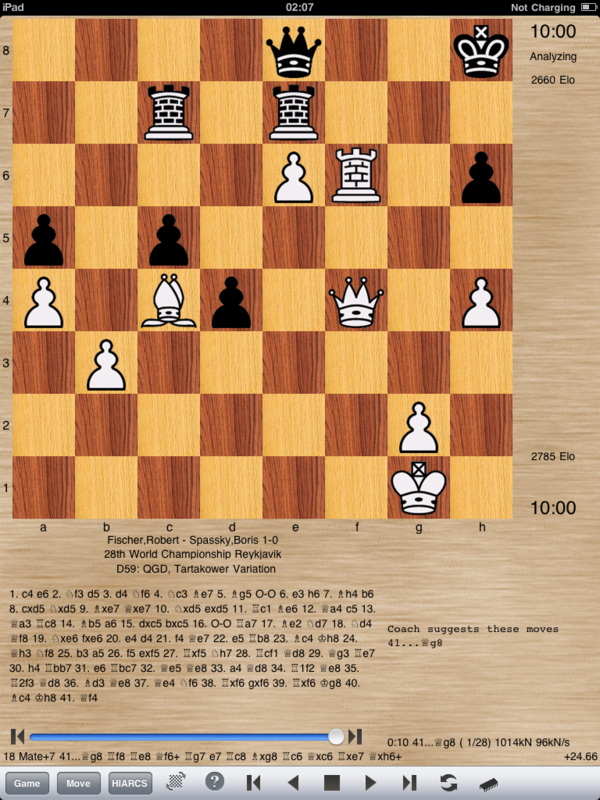 Many chess players need to remain up to date with the latest chess opening theory throughout the year and that is where our online book access subscription can help, giving you the latest and strongest opening book straight into the Opening Explorer view of your HIARCS Chess Explorer application. For many years HIARCS has had the strongest opening book available and it keeps getting stronger with every release. We have even supplied the HIARCS tournament chess opening book to help many time World Chess Champion, Vishy Anand's team prepare for matches and tournaments.  Online access to the official HIARCS Human Reference and GM++ books with latest human theory and play updated monthly. Click for more details on all HIARCS Opening Books and subscriptions. If in addition you want access to the HIARCS tournament opening book in Chessbase CTG or HIarcs HCS format you need the HIARCS Chess Opening Book Subscription instead. ¹ Computer opening books contain positions, moves, statistics and play recommendations, they do not include games and textual comments. World's Strongest Chess Openings Book. Includes online access to our unrivalled Tournament, Human Reference and GM++ opening books totally over 91 million positions! Each HIARCS product comes with its own chess opening book at the time of the release of the particular product. However, many chess players need to remain up to date with the latest chess opening theory throughout the year and online chess engine players like to have the latest and strongest chess opening book. For many years HIARCS has had the strongest opening book available and it keeps getting stronger with every release. We have even supplied the HIARCS tournament chess opening book to help many time World Chess Champion, Vishy Anand's team prepare for matches and tournaments. The latest HIARCS tournament opening book is available in Chessbase CTG format (for PC), HIARCS' own HCS format for Mac and PC with regular updates for subscribers to the HIARCS Chess Opening Book Subscription product. Improvements per year have averaged about 80 Elo points. Over the course of a year the opening book may contribute more to chess strength improvement than the increase in chess engine strength. Latest HIARCS tournament chess opening book in CTG, HBG and HCS formats with online access for HIARCS Chess Explorer customers. Quarterly updates usually in July, October, January and April - you will be sent an email with details of each update. Upon purchase you will receive a link and login details for downloading the latest HIARCS opening book and many previous opening books!. HIARCS Chess Opening Books are for software download only. They require either the HIARCS Chess Explorer GUI (direct access), a Chessbase/Fritz GUI for CTG, HIARCS chess engine for HCS or HIARCS Chess on iPhone/iPad for HBG. Statistics are only available for direct access, CTG & HBG format books. The HCS format book can be used by HIARCS 14 engines on Mac and PC. Suitable for significantly improving the performance of any chess player or chess engine. "Clearly a lot of work has been put into this book to provide strength in depth so the openings hold up in different time control games. Deep Junior Yokohama UCI is a PC Windows software download product only. It does not include a Graphical User Interface (GUI) so requires a GUI such as HIARCS Chess Explorer, Fritz, Chessbase, Arena, Chess Assistant, Shredder, Chess Partner etc, that support UCI engines. World's strongest iPhone chess software. Suitable for all, from beginner to strong Grandmaster with human-like play, energy saving handicap levels and coaching. HIARCS is a multiple World Championship winning chess program that has proven to be the strongest chess program on Palm and Pocket PC devices and is now available for the iPhone and iPod Touch. This power enables your iPhone to play chess like a super Grandmaster, analyse games and chess problems with you, while offering numerous features to help you learn and improve as you play with HIARCS. To find out more about this new Apple iPhone chess product visit our HIARCS iPhone Chess product page. "The playing program is good. It is good enough to beat 99.9% of chess players on this planet....It gives an excellent entertainment and educational value...On the scale of 1 to 10, I give it a 9.5. Well done!" - review of HIARCS iPhone Chess by Susan Polgar, former Women's World Chess Champion and award-winning chess author. World class iPad chess software. Platform: iPad - all editions (iOS 8.0 or later) - inc. Retina graphics. HIARCS is a multiple World Championship winning chess program that has proven to be the strongest chess program on Palm and Pocket PC devices and is now available for the iPad. This power enables your iPad to play chess like a super Grandmaster, analyse games and chess problems with you, while offering numerous features to help you learn and improve as you play with HIARCS. To find out more about this new Apple iPad chess product visit our HIARCS iPad Chess product page. scoring an incredible undefeated 9½/10 points (3 points clear of second placed Grandmaster) and 2938 Elo performance rating! HIARCS 13.1 on Pocket PC the highest rated PDA chess program in history with 2749 Elo on the official SSDF rating list. Visit our Pocket Chess HIARCS page. Palm Chess Pro has won 4 matches with chess Grandmasters -the strongest and most successful handheld chess player in history! For over 15 years some of the best chess players in the world including multiple World Champions have been using HIARCS to prepare, analyse and play against. HIARCS is the result of 25 years active development by author Mark Uniacke and was the first PC chess program in history to win a match with an International Master (1996) and in 2003 it became the first chess program on a single processor to draw a match against a Super GM. In 2005 HIARCS on a Palm PDA became the first and only handheld chess program in history to defeat a GM in a match and in 2006 it was again the first and only handheld chess program to win a GM/IM tournament! In 2008 our Pocket PC chess engine won the 2008 Mescusor Cup in Buenos Aires, Argentina ahead of Grandmasters scoring 8/10 in the process. This is a performance of 2691 Elo which is the best ever chess performance rating of a chess program on PDA in a Grandmaster tournament in history. Meanwhile its big brother HIARCS on PC and Mac was producing brilliant attacking chess to win a number of international computer chess tournaments and was top single computer in the World Computer Chess Championship in Beijing, China, Oct 2008. In August 2009, our Pocket PC chess engine went more than one step better by scoring an unprecedented and undefeated 9½/10 points (3 points clear of second placed Grandmaster) and 2938 Elo performance rating! The greatest performance by any handheld chess computer in history. Even the world's greatest ever player, Garry Kasparov, used HIARCS to prepare for IBM's Deep Blue 2! Unsure if you need a professional chess program like HIARCS? - read our "Why Choose HIARCS?" page. 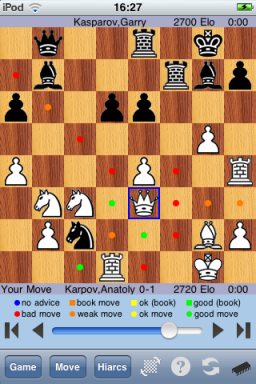 Historical old HIARCS version now being made available on our free chess software page. We can confirm that the HIARCS team provided help to 5 time World Chess Champion Vishy Anand in his matches with Veselin Topalov, Boris Gelfand & Magnus Carlsen.